The slapstick comedy generator, Octodad, will receive two bonus levels next Tuesday October 14. "Dad Romance" and "Medical Mess" will be added in a patch to all current and future owners of the game. It'll also go on sale at half price for a week. "Medical Mess" is a short hospital skit, and "Dad Romance" will cover Octodad's first meeting with his future wife, Scarlet, aboard the Cod of War. 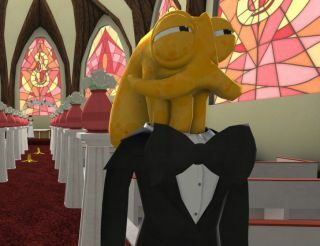 Developer Young Horses announced the update on the Octodad blog. "After the great response Octodad received from y’all, we wanted to give back a little in thanks for your spectacular support of our fine little game." They also put out an announcement trailer, which touches on how horrifying Octodad would be if he wasn't a cute orange cartoon character.